The feasibility of using novel electromagnetic wave sensors for real-time monitoring of metal pollution in water was assessed. Five solutions with different concentrations of lead (0, 1, 10, 50, 100 mg/L) were measured using several sensing methods: UV–Vis spectroscopy, low frequency capacitance and resistance measurements, and two sensing systems based on microwave technology. 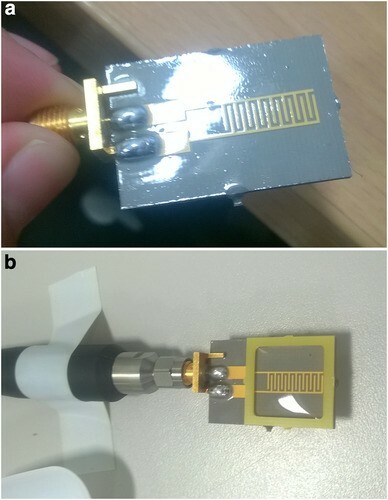 With this last approach, two sensing devices were used: a resonant cavity and a planar sensor with gold interdigitated electrode design printed on a PTFE substrate with a protective PCB lacquer coating. Results confirmed the ability of these systems to quantify the lead concentration as changes in spectrum signal at specific frequencies of the electromagnetic spectrum. Spectra were unique, with clearly observed shifts in the resonant frequencies of the sensors when placed in direct contact with different lead solutions, demonstrating the possibility of continuous monitoring with great sensitivity, selectivity, and high spatial and temporal resolution. Consequently, determination of trace and toxic metals using microwave spectroscopy is a promising alternative to traditional grab-sampling and laboratory based analyses. On-line and continuous monitoring of real-time metal concentrations offers the potential for a more effective emergency response and the platform for better scientific understanding and remediation of contaminated mine drainage. Die Anwendbarkeit von elektromagnetischen Sensoren zur Echtzeitüberwachung der Metallbelastung von Wässern wurde überprüft. Fünf Lösung mit verschiedenen Bleikonzentrationen (0, 1, 10, 50, 100 mg/L) wurden mit verschiedenen Methoden gemessen: UV-Vis-Spektroskopie, Niederfrequenzkapazitäts- und Widerstandsmessungen und zwei auf Mikrowellentechnologie basierende Sensorsysteme. Für letztere wurden zwei Messgeräte genutzt: ein Resonanzhohlraumsensor und ein Flächensensor mit Gold-Interdigitalstruktur, aufgedampft auf ein PTFE-Substrat mit einer PCB-Schutzschicht. Die Ergebnisse bestätigten die Eignung dieser Systeme, die Bleikonzentration als Änderungen des Spektrumsignals bei spezifischen Frequenzen quantitativ zu bestimmen. Im direkten Kontakt mit verschiedenen Bleilösungen zeigten die Sensoren eindeutige sowie deutliche Ausschläge der Resonanzfrequenzen. Damit bieten diese die Möglichkeit der kontinuierlichen Überwachung mit einer großen Empfindlichkeit, Selektivität und einer hohen räumlichen und zeitlichen Auflösung. Die Bestimmung von Spurenmetallen und toxischen Metallen mittels Mikrowellenspektroskopie stellt damit eine vielversprechende Alternative zur herkömmlichen Probenahme mit anschließender Laboranalyse dar. Die Online- und Echtzeitüberwachung von Metallkonzentrationen bietet die Möglichkeit eines effektiveren Notfallschutzes sowie die Plattform für ein besseres wissenschaftliches Verständnis und die Behandlung von belasteten Grubenwässern. Se analizó la factibilidad de utilizar sensores electromagnéticos para el monitoreo en tiempo real de la polución del agua por metales. Cinco soluciones con diferentes concentraciones de plomo (0, 1, 10, 50, 100 mg/L) se midieron usando varios métodos: espectroscopía UV-Vis, capacitancia de baja frecuencia y mediciones de resistencia y dos sensores basados en tecnología de microondas. Con esta última aproximación, se usaron dos instrumentos distintos: una cavidad resonante y un sensor plano con electrodo de oro interdigitado impreso en un sustrato PTFE con un revestimiento protector de laca PCB. Los resultados confirmaron la capacidad de estos sistemas para cuantificar la concentración de plomo como cambios en la señal espectral a frecuencias específicas del espectro electromagnético. Los espectros fueron únicos con picos claros en las frecuencias resonantes de los sensores cuando se ubican en contacto directo con las soluciones de diferentes concentración en plomo, demostrando la posibilidad de un continuo monitoreo con buena sensibilidad, selectividad y alta resolución espacial y temporal. Consecuentemente, la determinación de metales tóxicos usando espectroscopía de microondas es una alternativa promisoria a la toma de muestra y el análisis de laboratorio. El monitoreo continuo y en línea ofrece la potencialidad de una respuesta más efectiva en emergencias y la plataforma para una mejor comprensión y remediación de los drenajes de mina contaminados. Mining can have a significant environmental impact, especially due to the presence of waste materials abandoned in waste heaps (Byrne et al. 2012; Hudson-Edwards 2016). Point and diffuse sources determine the dispersion into the environment of toxic inorganic pollutants, mainly metals (Cd, Pb, Cu, Zn, Ni, Fe, etc. ), a process driven largely by the oxidation and subsequent hydrolysis of metal sulphides. Typically, mine waters have a clear correlation between low pH, metal, and sulphate content. This phenomenon, known as acid mine drainage (AMD), has been described as the biggest environmental problem associated with mines (Younger et al. 2002). Therefore, adequate monitoring and assessment is required to minimise the environmental risk posed by AMD from active and abandoned mining sites all over the world. Assuring a high quality of water and protecting it from chemical contamination is a major sustainable development goal. In the UK, according to the Environment Agency (2008), 9% of the rivers in England and Wales, and 2% in Scotland fail environmental standards because of contaminated drainage from more than 3000 abandoned metal mines. The Mineral Policy Center (Lyon et al. 1993) estimated that 557,650 abandoned mines in the USA are polluting over 19,000 km of the nation’s waterways. Implementation of the European Water Framework Directive and US Clean Water Act requires new methods and systems to be able to monitor water resources in real-time, with low cost and easy maintenance (Allan et al. 2006; Brack et al. 2017). The Agency for Toxic Substances and Disease Registry (ATSDR), places lead in second position in its substance priority list. Lead concentrations in mine water range from < 0.01 to 12 mg/L (Byrne et al. 2012); however, concentrations in excess of this may not be uncommon where evaporation causes concentration of metals. The UKTAG established an environmental quality standard (EQS) for dissolved Pb in surface water of 7.2 ppb (Rowland et al. 2011). Generally, the ionic form of Pb (Pb2+) is considered most toxic. However, other weakly complexed species (oxides, hydroxides, and sulphates) are also cause for concern. Lead exists primarily in its ionic form at pH < 4 and will precipitate or sorb to other phases as the pH increases (Smith 1999). Trace contaminants in polluted watersheds are normally measured by laboratory analysis of grab samples: mostly anions are detected by ion chromatography (IC) and cations (including metals) by spectroscopy: AAS (atomic absorption spectroscopy), ICP-OES (inductively coupled plasma—optical emission spectrometry), ICP-MS (inductively coupled plasma—mass spectrometry) and INAA (instrument neutron activation analysis) (Yang et al. 2010). These methods present several advantages, including high sensitivity, low detection limits, and the opportunity to detect many trace metals simultaneously. However, they also have several drawbacks: they require a constant supply of costly chemicals and a well-trained staff for reliable operation, and they cannot provide in-situ and real-time data, which limits our ability to monitor and manage remote sites and to detect the immediate effects of accidental or unexpected contamination events. The need for on-line monitoring has sparked the development of various remote detection and smart monitoring systems (Mukhopadhyay and Mason 2015). To address this, a research group from the Built Environment and Sustainable Technologies (BEST) Research Institute at the Liverpool John Moores University has developed a novel sensing system based on electromagnetic (EM) wave techniques for real-time detection of changes in materials across a range of industrially relevant applications. The real-time nature of the measurements and potentially portable sensor size makes this approach a viable alternative to mainly lab-based methods of health and safety (Mason et al. 2014c) and quality control in the food industry (Joshi et al. 2016; Korostynska et al. 2013a; Mason et al. 2016), in aquaculture (Korostynska et al. 2015; Nakouti et al. 2014) and environment (Korostynska et al. 2014a; Mason et al. 2014a, 2014b). The principle is based on the interaction of propagating or resonating EM modes within the material being tested. By considering how reflected microwave signals vary at discrete frequency intervals, the changes in the signal can be linked to the amount and type of sample being tested. Research (Korostynska et al. 2013b, 2014b, c) has confirmed the potential of a novel microwave sensor for water analysis, observing changes in the microwave part of the electromagnetic spectrum depending on the materials being analysed. Such work has laid the foundations for new methods, based on EM sensors, for qualitatively and quantitatively determining metal concentrations in mining areas. Several other technologies have been recently developed as alternatives to traditional grab sampling and laboratory analysis. For example, the problem of sampling rate and sample preparation (filtration and acidification) can be solved using auto-sampling equipment, but this can introduce error into measurements and reduce one’s ability to determine a significant event because of the sampling frequency. This last issue has been addressed by Chapin (2015) who developed a water sampler, the MiniSipper, able to acidify, filter, and grab water samples at a high frequency, thanks to its capacity to grab up to 250 five mL samples. It uses gas bubbles to separate small sample amounts (for ICP-MS analysis) in a long tubing coil. This approach is advantageous for detecting an unexpected event (due to its capability to collect samples with high frequency), for its capacity to prepare samples directly in the field for analysis in laboratory, and for improving our understanding of the geochemical response to temporally variable processes. However, this method is not able to reduce the high costs of laboratory analysis. Various technologies offering in-situ and on-line monitoring capability are in development, offering particular advantages for surveillance and early warning (O’Flynn et al. 2010), and several of these are potentially attractive for on-site wastewater quality monitoring (Korostynska et al. 2013c). This includes analysing metal contaminants in wastewater using: biosensors (Eltzov et al. 2015), optical systems (Gómez-de Pedro et al. 2014) and electrochemical techniques (Bansod et al. 2017). However, further work is needed to develop simple, reliable, and cost-effective techniques for remote detection of pollutants, to better understand processes that regulate metal dispersion and allow for an emergency response to unexpected events (Byrne et al. 2013; Cidu et al. 2011; Jones et al. 2013; Lynch et al. 2017). No single system available today can fully meet the needs to determine, in real-time, the composition of water to the desired sensitivity level and cost-effectiveness for effective remediation and long-term monitoring of water bodies affected by metal mine drainage. 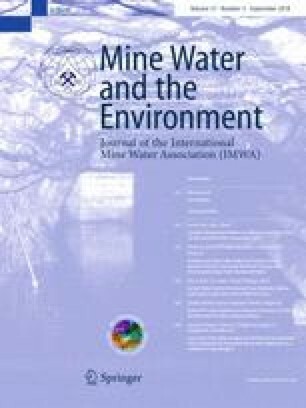 The aim of this study was to assess and compare the use of the new sensor system for detecting changes in Pb concentrations in mining-affected water. Spectrum responses for four properties (absorbance, capacitance, resistance, and reflected power) at three frequency ranges were monitored and analysed. This will allow us to improve the features of these sensing systems to simultaneously analyse a range of metals at low concentrations, allowing for continuous in-situ monitoring, thus solving the limitations of lab-based technologies. Five samples of lead at different concentrations (0, 1, 10, 50, 100 mg/L) were prepared using different volumes of Pb 1000 ppm ICP standard solution certified (Sigma 41318) dissolved in deionised water in a 50 mL volumetric flask. Each sample was acidified with 1% nitric acid (analytical grade, 67%) to avoid precipitation. Samples were placed in high-density polyethylene bottles. All prepared standards produced clear solutions. All measurements were performed in an air-conditioned environment at a constant temperature of 18 °C. Resistance (Rp) and capacitance (Cp) between 20 and 200 kHz (with impedance ranging from 1 to 25 Ω) using a programmable LCR bridge (L = inductance; C = capacitance; R = resistance; Hameg 8118), requiring a 400 µL sample size. All samples were measured five times with each method to assess repeatability. The spectrophotometer technique used a standard cuvette to enable exposure of the sample to light, and the LCR meter made use of an open-ended coaxial probe. The microwave measurements made use of two sensors: a resonant cavity (Fig. 1) and a gold eight-pair IDE pattern printed on a planar polytetrafluoroethylene (PTFE) substrate with a PCB lacquer coating (Fig. 2). The coating was added to prevent short-circuiting when the sensor was exposed to the sample. Both sensors were designed so as to limit the samples’ position and volume, which makes it possible to detect small changes in sample composition. These changes can be related to the composition of the materials and/or their relative concentrations (Mason et al. 2016). Spectra measured with the resonant cavity and IDE sensor were recorded for air and five concentrations of lead, demonstrating the dissimilar output of the sensor for different kind of samples. 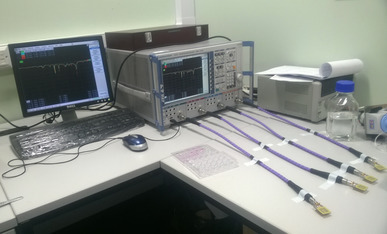 Moreover, to evaluate the reproducibility of the method, four different IDE sensors were simultaneously tested using four different channels to measure the reflected power (Fig. 3). Results obtained using the described measurement techniques were used as an indicator of lead content. Results were analysed using Excel, OriginPro9, and Curve expert Basic 1.4. Best-fit curves for different Pb concentrations at specific frequencies of the EM spectrum were evaluated using the coefficient of determination (R2), equal to the square of the Pearson correlation, which corresponds to the covariance of two variables divided by the product of their standard deviations. Absorbance spectra between 200 and 350 nm (UV) are shown in Fig. 4a, and represent the only area of the measured optical spectra where significant variation in absorbance occurred with varied lead concentrations. The chemical information given by an absorption spectrum is contained in the position and intensities of the absorption band. It is clearly visible that the absorbance is related to the Pb concentration, particularly at the 300 nm peak. Linear correlations at two wavelengths, 247 and 300 nm, are shown in Fig. 4b, with high correlation in both cases (R2 equals 0.9757 and 0.9869, respectively). 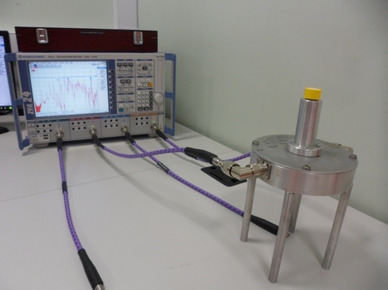 Capacitance and resistance magnitude results were used, in combination with optical and microwave responses, for sensor evaluation. Correlations between Cp, Rp and Pb content are shown, respectively, in Figs. 5 and 6. It is clear that these parameters changed with the Pb concentration. In fact, high linear correlation with Pb concentration was identified for both parameters: for Cp, where R2 = 0.79 at 30 Hz and R2 = 0.95 at 6 kHz; for Rp, with R2 = 0.9869 at 180 Hz and R2 = 0.9757 at 200 kHz. The response for the microwave sensor is given in dBm, and demonstrates a shift in amplitude correspondent at different frequencies to the concentration of lead in each sample. After each measurement, responses returned to the original position (air spectra), confirming that the developed resonant cavity and microwave sensors are reliable and reusable, and thus a sustainable solution for continuous water quality monitoring. The resonant cavity demonstrated the capability for its output to change (see Fig. 7, which illustrates the raw signal output of the sensor) as a result of the five different Pb concentrations. Figure 8 shows good correlation (with R2 = 0.9527 and R2 = 0.9017) between the concentration and changes in output at two frequencies, 415 MHz and 2.45 GHz, after processing of the raw data. This gives confidence that the technique is an attractive option for real-time detection of metals in water. The microwave spectrum in the frequency range 500 MHz–15 GHz obtained by measurements with the IDE sensor is shown in Fig. 9. During the measurements, significant pronounced resonant peak shifts were noticed when the different samples were placed in contact with the sensor pattern. This shift was more evident when the samples had a higher concentration of Pb. This is clearly visible in several parts of the spectrum, in particular between 300 MHz and 3 GHz. The shift in the spectrum with the best linear correlation among the Pb samples was in the frequency range of 2.3–2.65 GHz (shown in the red rectangle in Fig. 9 and magnified in Fig. 10). The correlations between reflected power and Pb concentration in each of 60.000 points of the frequency range 10 MHz–10 GHz, were calculated with the square of Pearson’s correlation using Excel. In this way, it was found that the best correlation was at 2.3952 GHz with R2 = 0.9982 (R2 = 0.978 in the peak at 2.4909 GHz). Statistical features, namely R2, sensitivity, and RSD (relative standard deviation), obtained by measuring these four properties with the described techniques are summarised in Table 1. Despite many recent technological advances, significant work remains to be accomplished before a reliable smart sensor for water quality monitoring is achievable. In this study, we measured moderate to high Pb concentrations in deionised water in lab samples at specific frequencies of the EM spectrum. Real mine water is more complex and characterised by high levels of dissolved metals and sulphate and, frequently, low pH. Therefore, the next step is to expand from the single metal analysis performed in this study to multi-element analysis and to the lower concentrations (< 1 mg/L) more commonly found in watercourses receiving mine drainage and natural dilution. Although there are obviously several challenges that must be overcome before this technology can ensure that measurements correctly identify distinct contaminants, despite their possible interference with each other, this paper clearly shows the feasibility of the proposed approach. Each spectrum contains 60,000 points, and by analysing the response at each point for different concentrations, metals, and water composition, it appears that this methodology could more accurately characterize multi-contaminant concentrations. We hypothesize that the microwave sensors presented in this paper can be the prototype for a smaller, portable, online system capable of monitoring pollution in mining areas. This sensing technology could provide continuous verification of water quality and safety, and provide immediate warning of contamination episodes or water quality guideline threshold breaches. Moreover, this methodology offers the potential to reduce analytical costs by combining wireless sensing systems to provide continuous, in situ remote monitoring, thus facilitating the targeted treatment of mining-affected waters. It could also offer the ability for in-situ, real-time monitoring and reporting of water quality over large, remote geographical areas and provide an early warning system for pollution events. The great challenge will be to develop sensors with different substrates and coatings to assess the wide range of water pollutants and to test them in the field for their selectivity and sensitivity. Electromagnetic wave sensors that operate at microwave frequencies can be used to determine Pb concentrations by producing EM wave spectra specific to this element, which was shown by variations in signal amplitude at distinct frequencies. The unique response shown from each sample and each sensor produced resonant peaks at difference frequencies, making the sensors a potentially attractive option for real-time monitoring of many contaminants. The developed sensors could be remotely operated with appropriate wireless hardware, and could be physically small, which would allow continuous real-time monitoring and subsequent mitigation of waterway pollution. Such on-line monitoring of real-time metal concentrations offers the possibility of more effective emergency response activities and remediation of contaminated mine drainage. The authors gratefully acknowledge the support of the Liverpool John Moores University, Faculty of Engineering and Technology PhD Scholarship Programme that allowed this research to be undertaken.